NEW Block of the Month & Do I Launder? We are so excited to present our new block of the month, Moonlight Sonata! It is a beauty!!! We will be starting our block of the month on April 1st. $16.99 is the monthly cost for 12 months and the pattern is $24. The quilt finishes at 102" X 102". 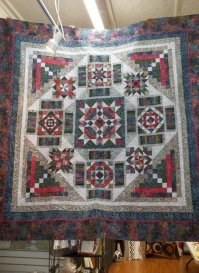 You must stop in the store to see this stunning quilt OR come to the Covered Bridge Quilters Guild show at the Princeton Fairgrounds on Saturday, March 21 from 9 - 5 or Sunday, March 22 from 11 - 4. It will be on display in our booth. Yes, we ship!!!! OK. We get asked this question several times a week, "Do you launder your fabrics?" Our answer is, "No, we do not wash the majority of our fabrics." We have to admit that one of the biggest reasons we do not launder is due to the time element. For the amount of quilts that we make, we just don't have the time to do so. Also, with quilt shop quality fabric (for the most part) the fabrics don't bleed and there is very little shrinkage. Could we have a problem some day? Of course we could! We always use a dye magnet when washing our quilts. If you are unsure of a fabric, cut a small piece off and put it in a glass of water. You will then know if you will have a problem. We have a special product called Retayne that will stop the bleed. Susan Knapp, our beginner teacher, always advises our students to launder their fabrics before they begin. She tells them to use ORVIS Quilt Soap. A very mild soap. If in doubt of bleeding, always prewash. If in doubt of shrinkage, you can just wet the fabric, put it in your washer to spin it out and continue drying. We like to put the fabric in the dryer and pull it out while it is still a little damp. This prevents any big creases. We then press the fabric with BEST PRESS. A wonderful starch alternative. Hope that helps!